From the roundabout in Glassford village, head west down Jackson Street along the country lane of Hunterlees Road. About 600 yards on, turn right at the small crossroads (passing the cemetery on yer left) for about half-a-mile, before turning left along a small track that head to some trees 400 yards along. Once you’ve reached the trees, walk uphill and follow the footpath to the right, keeping to the tree-line. It eventually runs to a small private graveyard. You’re there! In the little-known private graveyard of the Struthers family on the crest of the ridge overlooking the River Avon and gazing across landscape stretching for miles into the distance, nearly a mile east of Glassford village, several hundred yards away from the Commonwealth graveyard, a cluster of yew trees hides, not only the 19th century tombstones, but remnants of some thing much more archaic. 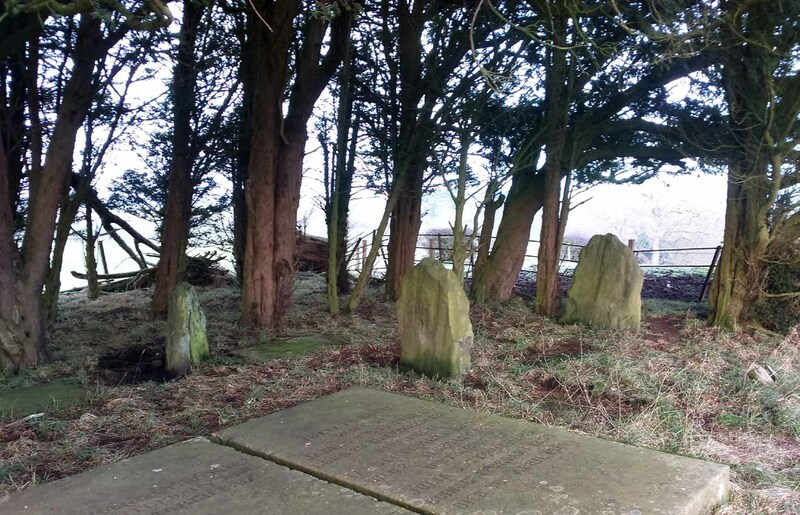 Three small standing stones, between 2½ and 4 feet in height, hide unseen under cover of the yews, at the end of a much overgrown ancient trackway which terminates at the site. They’re odd, inasmuch as they don’t seem to be in their original position. Yet some form of archaic veracity seems confirmed by the weathered fluting: eroded lines stretching down the faces of two of the taller stones and, more importantly, what seem to be cup-markings on each of the monoliths. 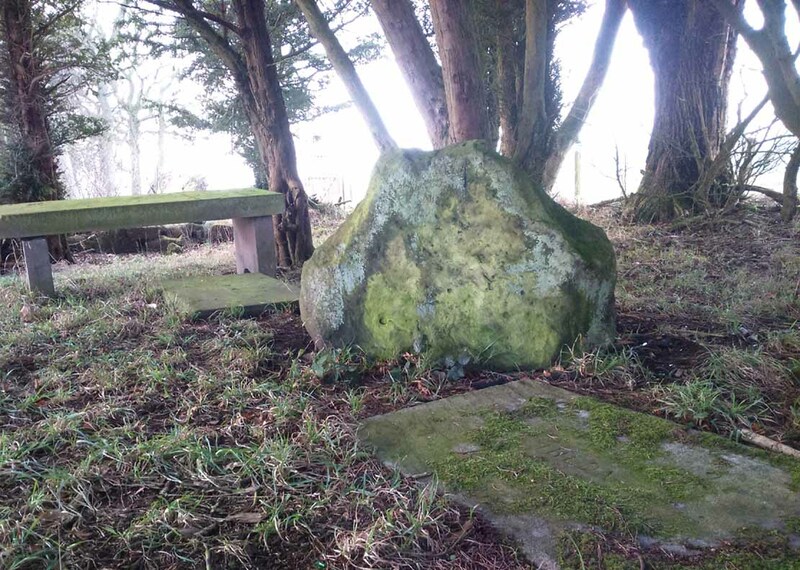 The tallest stone at the eastern end of the graveyard has a deep cup on its crown. This may be the result of weathering; but we must exercise caution with our scepticism here. Certainly the eroded lines that run down this stone are due to weathering – and many centuries of it; but the peculiarity is that the weathering occurs only on one side. This implies that only one side of the stone was open to the elements. The second, central stone of the three, is slightly smaller than the first. Unlike the eastern stone, its crown has been snapped off at some time in the past century or so, as evidenced in the flat smooth top. 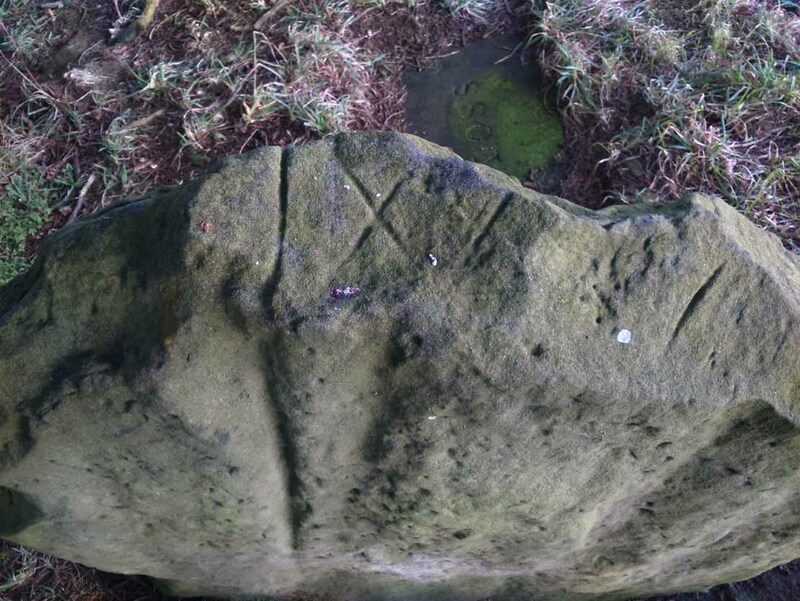 But along the top are a series of small incised marks, one of which includes a notable ‘X’, which may have been surrounded by a circle. A second fainter ‘X’ can be seen to its side, and small metal-cut lines are at each side of these figures. Another small section of this stone on its southern edge has also been snapped off at some time in the past. The most notable element on this monolith is the reasonably large cup-mark on its central west-face. It is distinctly eroded, measuring 2-3 inches across and an inch or more deep. Its nature and form is just like the one in the middle of the tallest of the standing stones at Tuilyies, nearly 31 miles to the northeast. 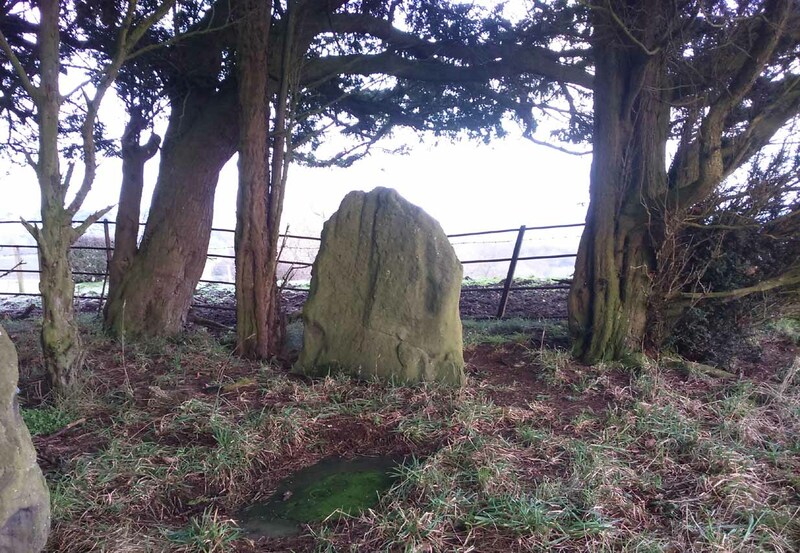 The smallest of the three stones is just a few feet away from the central stone. To me, it seemed oddly-placed (not sure why) and had seen the attention of a fire at its base not too long ago. 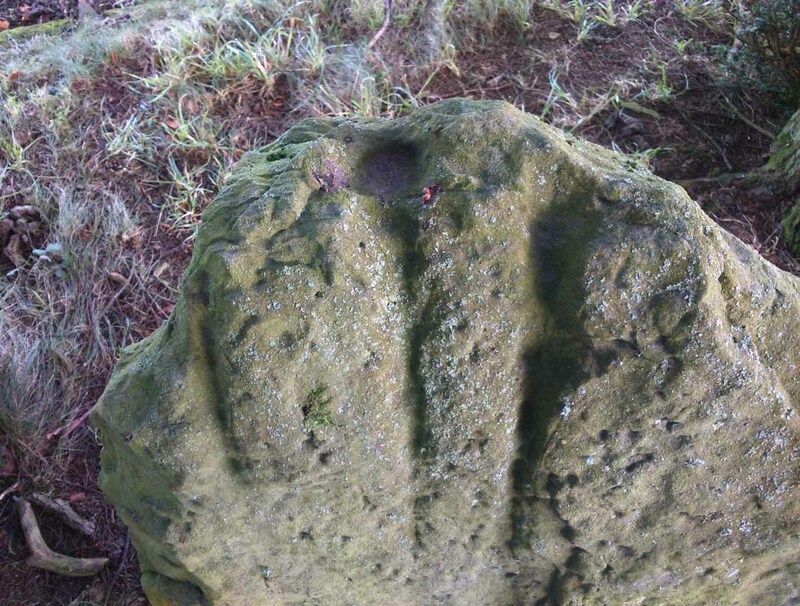 On its vertical face near the top-centre of the stone, another cup-marking seems in evidence, some 2 inches across and half-an-inch deep—but this may be natural. The Glasgow archaeologist Kenneth Brophy reported that on a recent visit, computer photogrammetry was undertaken here, so we’ll hopefully see what they found soon enough. 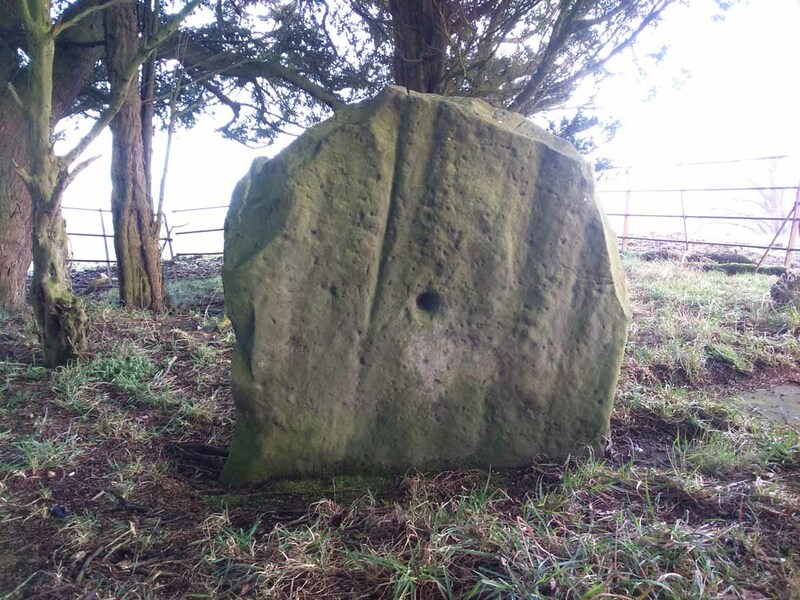 There is some degree of caution amongst some archaeologists regarding the prehistoric authenticity of the Glesart Stanes – and not without good cause. Yet despite this, the seeming cup-marks and, particularly, the positioning of the stones in the landscape suggest something ancient this way stood. The stones here are more likely to be the remains of a once-larger monument: perhaps a cairn; perhaps a ring of stones; or perhaps even an early christian site. At the bottom of the hill for example, just 350 yards below, is a large curve in the River Avon on the other side of which we find the remains of an early church dedicated to that heathen figure of St. Ninian (his holy well close by); and 300 yards north is the wooded Priest’s Burn, whose history and folklore seem lost. The “faint circle” described by Mr Stewart is barely visible now. 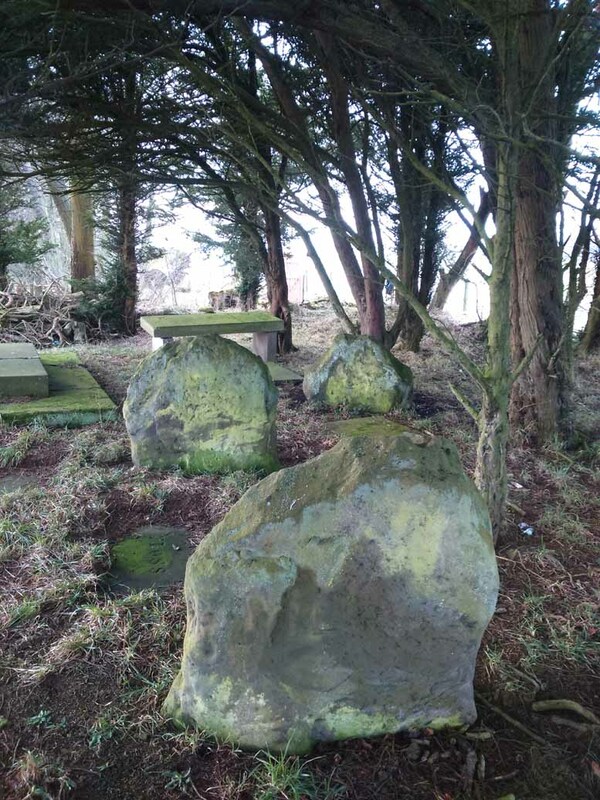 And the idea that these “three stones” gave their name to the farmhouse and road of the same name at the other side of Strathaven, three miles west, seems to be stretching credulity to the limits. Surely? 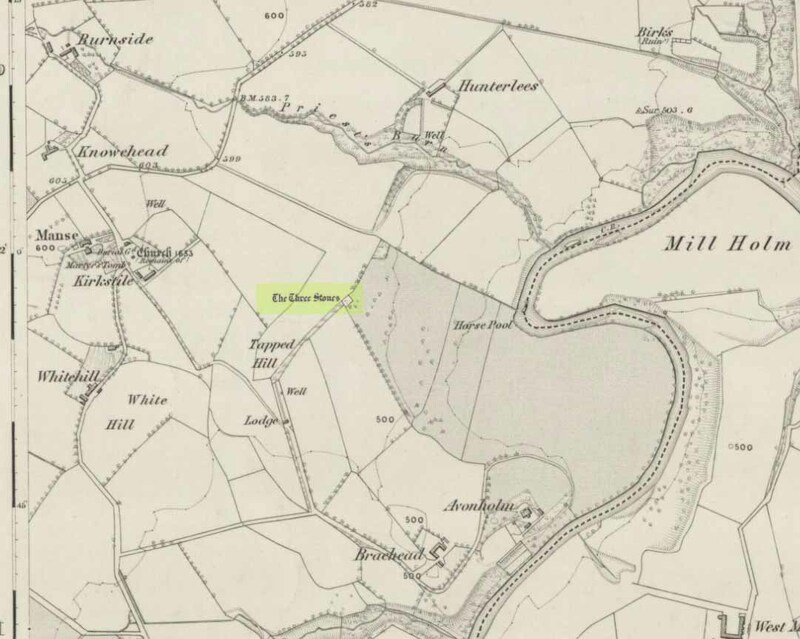 Groome, Francis H., Ordnance Gazetteer of Scotland – volume 1, Thomas C. Jack: Edinburgh 1884. M’Whirter, M.T., “The Standing Stones at Glassford,” in Hamilton Advertiser, 1929. Stewart, William T., Glasford – The Kirk and the Kingdom, Mainsprint: Hamilton 1988. Wilson, James Alexander, A Contribution to the History of Lanarkshire – volume 2, J. Wylie: Glasgow 1937. 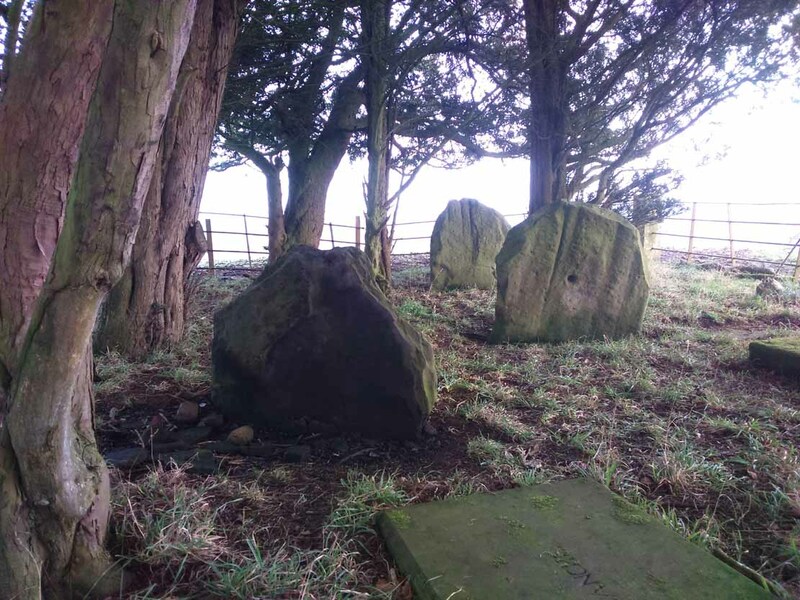 This entry was posted in Lanarkshire, Scotland, Standing Stones and tagged antiquarian, antiquities, Archaeology, Avonholm, Bronze Age, Cup-and-Ring Stones, cup-markings, druids, earth mysteries, folklore, geomancy, Glassford, graveyards, heritage, Lanarkshire, megalithic, Megaliths, monoliths, neolithic, Petroglyphs, prehistoric rock art, prehistoric sites, sacred sites, Scotland, Standing Stones, Stone Circles, Stonehouse, Strathaven, tradition. Bookmark the permalink. I would never call St Ninian a heathen figure, but I know what you mean and where you’re coming from. Those are pretty fascinating and look well worth a visit on my next drive further up Scotland. Do you think the recent fire mark is just because the stone is pretty near a bench and a visitor maybe spent the night there and lit a fire? There is no resting spot in this area. It is rural but it’s not too far from the road either. It will more than likely be someone from nearby out for a wander who had no idea what it was he was damaging. Or it could be a local youth however I’d expect a bigger fire and lots of rubbish to go with it.